Valve Authority is a term used to describe the basis on which a control valve is selected. Quality in design represents the correct consideration of many engineering decisions and sizing control valves based on authority is an important factor. If the control valve is oversized, the performance, life span and reliability of the valve and other equipment items will be reduced. If we undersize then we may have the authority but cannot achieve the design capacity. Additionally, designs should consider energy optimization but this often leads to poor authority. N is the Valve Authority. ΔPvalve is the pressure drop across the valve in the fully open position. ΔPtotal is the total pressure drop across the circuit. In order to develop good control, it is recommended that a control valve is selected to achieve a valve authority of 0.5 or greater. An authority below 0.25 gives unstable control; 0.25 – 0.5 gives fair to good control whereas 0.5 -1.0 gives excellent control. The higher the authority, the greater the energy wastage. Let’s consider a simple water circuit example where the available pump pressure is 13 kPa at maximum flow conditions, i.e. the valve is in the fully open position. This 13 kPa represents the total frictional resistance of the circuit including the control valve which has a pressure drop of 6 kPa in the fully open position. Let’s consider a design example to explore the phenomenon of valve authority a little further. It is intended to model a section of pipework downstream of a heat exchanger transporting Methyl Diethanolamine (MDEA) going to a column. The system pressure shall be controlled by a pressure reducing control valve with a design valve authority of approximately 0.5. The engineer is also required to ensure that the pipelines in the system are to be sized such that the gas superficial velocity (vapor velocity) exiting the system is between 10 & 15 m/s. Temperature of MDEA at system inlet: 106.5 °C. Vessel Surface Pressure: 5 bar a.
Elevation to Vessel Base: 3 m.
Pressure at outlet: 1.8 bar a. Design Flow at system outlet: 367,000 kg/h. 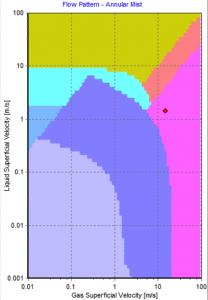 Fluid Vapor Quality Approx. 0.06. 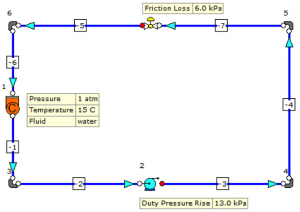 Let’s develop this outline scheme design such that the pressure drop across the control valve is minimised which is consistent with good control. Good control of course means that the design valve authority should be around 0.5 and in all circumstances, must be above 0.2. We know the vessel surface pressure is 5 bar a and the design outlet pressure is 1.8 bar a. The total system pressure loss between the inlet and outlet of the circuit can be established as 3.2 bar. 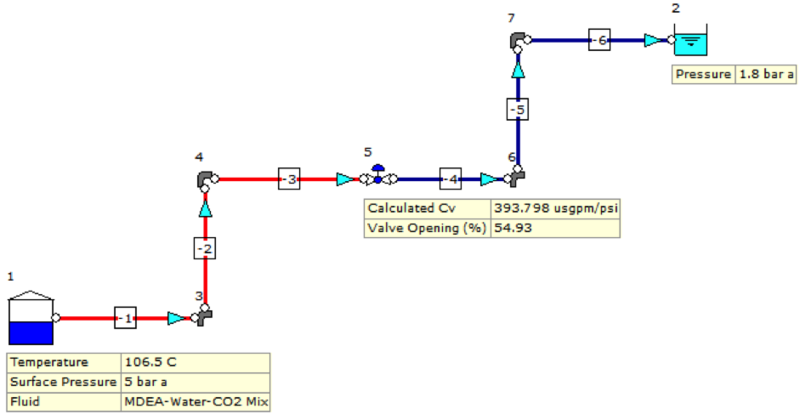 This means that, based on a design valve authority of 0.5, we can estimate the valve pressure loss at the design flow rate of 367,000 kg/h to be around 1.6 bar (3.2 bar x 0.5 = 1.6 bar). This data can be used as the basis of a preliminary design as outlined in Step 1. A preliminary design of the system has been developed based on the design flow rate provided. A Flow Coefficient (Kv component) can be used in the first instance to represent a pressure reducing valve as at this stage, we simply wish to define a fixed pressure drop of 1.6 bar across the component. Figure 2 provides an illustration of the system. Figure 2: MDEA Circuit – Control Valve represented by a Flow Coefficient (Kv). When this initial design is calculated, the MDEA in the system is detected as being a two-phase fluid with a vapor quality of approximately 6.7%. For two-phase systems, a useful rule of thumb is to keep the gas superficial velocity around 15 m/s at this vapor quality. At this point, it’s often useful to know what flow regime is encountered in the system. In this particular design case, the flow in the lines is in the annular mist regime which is preferable to slug flow which of course should be avoided. This undesirable slug flow regime can be avoided by keeping the gas superficial velocity relatively high. Figure 3: Annular Mist Flow Pattern Map. 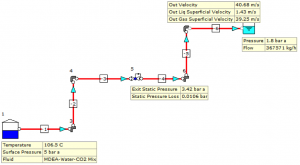 Various pipe diameters can be applied to this system in an attempt to achieve a flowing velocity which is as near as possible to the design velocity of 10 to 15 m/s. 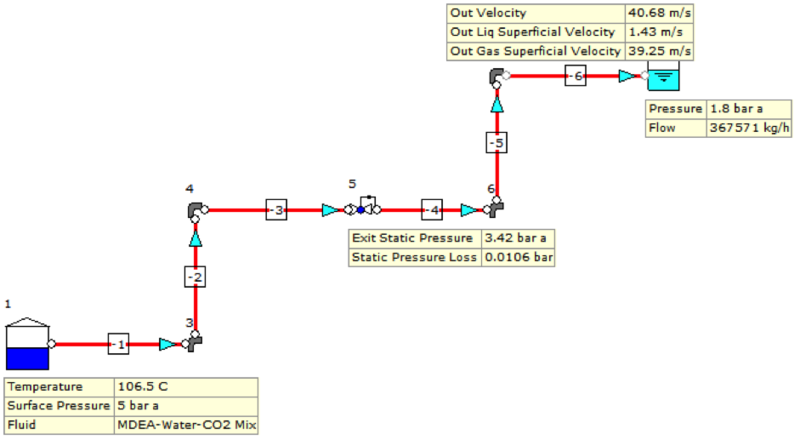 This preliminary design case has been solved using 300mm pipes which generates an initial velocity of 14 m/s. It is worth noting at this point that as the fluid flows along the pipelines, the frictional resistance of the various pipes and fittings results in an increase in the vapor quality and hence, gas volumetric flow rate and flowing gas velocity. 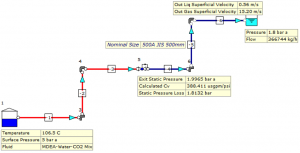 This phenomenon would at this early stage indicate that it may be prudent to increase the pipe diameters in the system – perhaps downstream of the pressure reducing valve. Indeed, a check on the velocity at the system outlet indicates the velocity increases to 112 m/s. This velocity is clearly much too high and should be reduced as the design evolves. The outline design completed in Step 1 can now be developed further. The Kv component can be changed to a PRV (pressure reducing valve) and this valve can be automatically sized. When sizing the valve, the outlet pressure in the MDEA system can be set to 1.8 bar a (based on the design data provided). The design setpoint pressure of the PRV can then be adjusted until the design flow rate of 367,000 kg/h is achieved in the system. 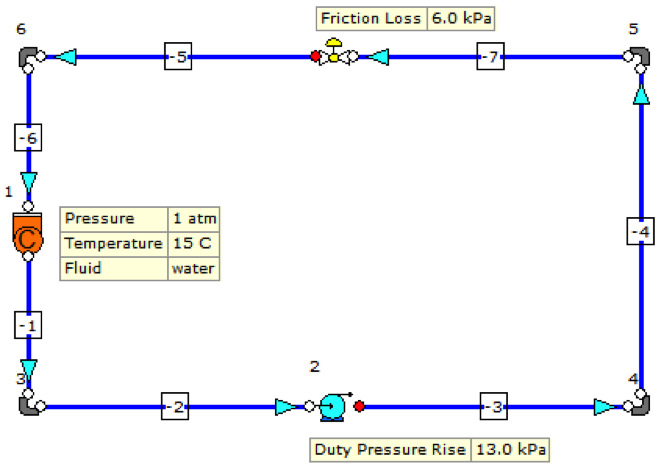 Figure 4: MDEA Circuit with Pressure Reducing Valve (PRV). At this point, it is worth considering different pipe diameters downstream of the PRV. The PRV setpoints pressure can also be adjusted until we obtain the required design flow for each pipe diameter considered. The calculated results are outlined in Table 1. Table 1: Review of Valve Authority for different Line Sizes & PRV Set-points. We can see that the preliminary line sizes of 450 – 500 mm produces a sufficiently high valve authority (N = 0.525 & 0.56). The next stage is to select the correct line size whilst giving consideration to the limiting velocity criteria of 15 m/s for the vapor phase. The most suitable pipe diameter is therefore the 500 mm pipe. Smaller pipe will also work, however we need to avoid choked flow in the system. We therefore need to keep the gas velocity below a max of 50 m/s. If capital cost was the main design criteria, you could consider using a smaller pipe size. Figure 5 provides an illustration of the system at this stage of development. Figure 5: MDEA Circuit – Pipe Sizes Optimised. 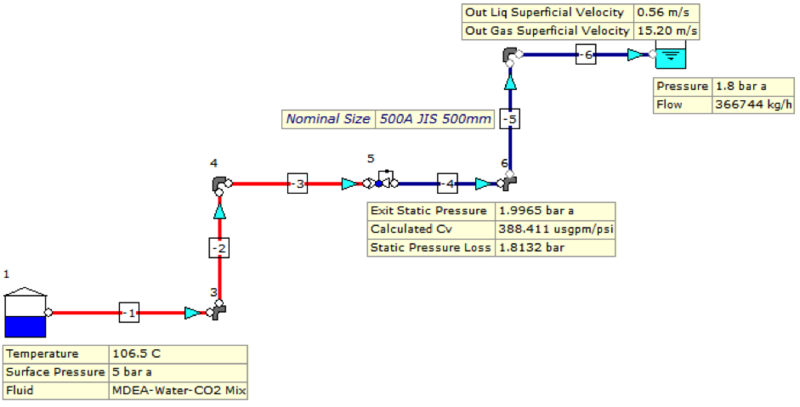 So far, the calculations have produced the valve Cv along with fluid physical properties. This data can be provided to the valve supplier so that they can make the final valve selection for their range of equipment. Finally, in this step the automatically sized pressure reducer can be swapped for the actual vendor control valve (Figure 6). In this final case, the pressure loss across the valve is calculated to be 1.5 bar which produces a valve authority of 0.47 (1.5/3.2 = 0.47). Figure 6: MDEA Circuit – Vendor Control Valve. This example helps us consider the application of valve authority in a real system design whilst giving due consideration to other aspects of the system such as fluid physical properties, valve Cv, design flow rates, pressures etc.